Creating University Partnerships has been a long-term goal. Embedding the Tutor/Mentor Institute into one or more universities can unleash the talent and resources of the university and its alumni. This PDF was created by a team of DePaul students in early 2000 as a "strategic plan" that universities could use as a starting point. Below is a proposed outline of how a university such as Northwestern, Michigan, DePaul (or any others) might be drawn into partnership. Goal: Development of student/faculty/alumni led marketing program which results in a year to year growth of NU faculty, students, alumni in building and sustaining programs which lead at-risk youth into careers. This SlideShare outlines this goal. 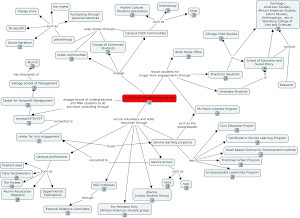 This map shows departments and organizations at Northwestern University that could be a source of partnership, volunteers, interns, ideas and support for Tutor/Mentor Connection. See actual full size map. Our goal is to recruit a team of students, faculty and/or alumni who will act as a “Tutor/Mentor University Connection” connecting the resources of the university to each other, to the Tutor/Mentor Connection, and to tutor/mentor programs operating throughout the Chicago region and the rest of the country. 1) recruit faculty volunteer from undergrad/grad/ and adult ed. This team has to understand and be committed to the long-term potential of being a partner to the Tutor/Mentor Connection by understanding the benefits to university, to teaching, to publishing, to students, to fund raising, etc. 2) what youth serving programs already exist in the area surrounding the university, or in its focus area? Build a directory. Plot on maps. Use blogs and social media to share information about these programs. 3) how can the percent of involvement in each of these categories increase, both in quantity, in quality, and in distribution throughout the Chicago region? Solutions should include recruiting students/alumni to volunteer in Chicago/Evanston tutor/mentor programs (and to help start new programs where there are voids, such as in non-school hours programs serving Evanston youth). Could also include students serving as non-paid interns in alumni companies to launch/lead recruitment/involvement campaigns from those companies. This provides manpower to company while offering visibility and introduction of student/job seeker to influential alumni. This should set the stage for prioritizing some year-round marketing efforts to generate annual increases in each of these categories, with the student/alumni team from one year providing a year-end report to the public (Forbes?) which also provides a vision and outline of goals which the next year's student team will adopt. Note, the alumni team should begin to stabilize after awhile, since alumni do not leave the community as often as students. This plan provides some recognition and incentive tools which can serve as motivators for students, faculty and alumni to participate. The better they do, the more powerful the recognition/motivators will be in encouraging future and further involvement.